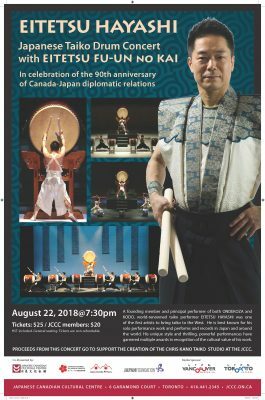 In the spirit of celebrating the 90th Anniversary of Canada-Japan Diplomatic relations, the Japan Foundation presents Eitetsu Hayashi: Japanese TAIKO Drum Concert Tour with Eitetsu FU-UN no KAI. 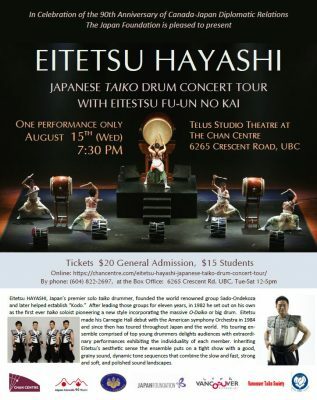 Japan’s premier solo taiko drummer, Eitetsu Hayashi, will embark on a tour across Canada this summer. The legendary musician will be on tour together with his ensemble of young drummers, the FU-UN no KAI ensemble, with concerts taking place in Calgary, Vancouver, Ottawa and Toronto. 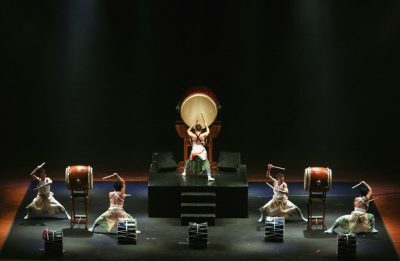 The sound of the taiko knows no boundaries, and without a doubt, will resonate with Canadian audiences across the country. 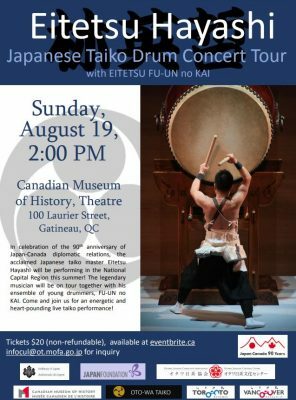 The Eitetsu Hayashi: Japanese TAIKO Drum Concert Tour with Eitetsu FU-UN no KAI will give people in Canada a rare chance to experience the musical creativity of an artist at the forefront of taiko drumming in Japan. 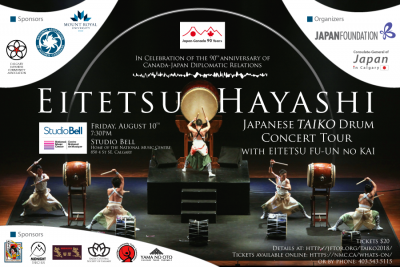 Eitetsu Hayashi: Japanese TAIKO Drum Concert Tour with Eitetsu FU-UN no KAI will perform at premier performance venues across Canada starting in Calgary, Vancouver, Ottawa and ending in Toronto. 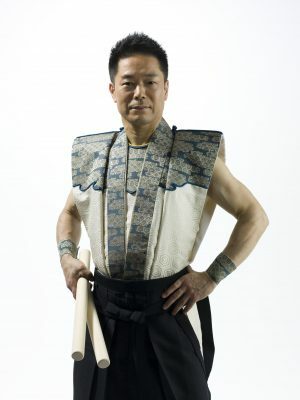 Eitetsu Hayashi will also be participating in taiko workshops in each of the cities to share his expertise with local Canadian taiko groups. In addition to the concerts, the tour will make a stop at the Calgary Japanese Festival “Omatsuri” at the Max Bell Centre in Calgary on Saturday, August 11th as well as the Japan Festival Canada at the Mississauga Celebration Square on Saturday, August 25th. Eitetsu made his Carnegie Hall debut with the American Symphony Orchestra in 1984. Since then, he has performed throughout Japan and the world. As a soloist, Eitetsu performed with the world’s top orchestras, including; the Boston Symphony Orchestra conducted by Seiji Ozawa in 1976 and 1999, and; the Berlin Philharmonic Orchestra conducted by Kent Nagano in 2000. The latter took place in Berlin’s Waldbühne with an audience of over 20,000 and was broadcast around the world. Eitetsu has also appeared in various festivals such as the Pacific Music Festival in Sapporo (2004), the Japan-Korea Music Festival (2005) and the Saito Memorial Festival in Matsumoto (2005). He received several awards in recognition of his contribution to traditional Japanese music, including the prestigious Japanese National Cultural Award, the 47th Education Minister’s Art Encouragement Prize in the Popular Entertainment Division (1997), and the 8th Award for Promotion of Traditional Japanese Culture, Japan Arts Foundation (2001). In 2016, Eitetsu celebrated the 45th anniversary of his performing activities, and in 2017, the 35th anniversary of his solo career. EITETSU FU-UN no KAI 英哲風雲の会 is the ensemble touring in the Eitetsu Hayashi: Japanese TAIKO Drum Concert Tour with Eitetsu FU-UN no KAI. This taiko ensemble, is made up of top young taiko drummers active in Japan. In addition to performing Eitetsu’s original compositions which feature the big O-Daiko drum, the members often perform together with him. FU-UN no KAI in Japanese refers to a favorable opportunity for highly aspiring people to achieve their goals. The name was a good fit because it reflects their spirit. The overwhelming power of their live performance have elicited strong responses across Japan and abroad. 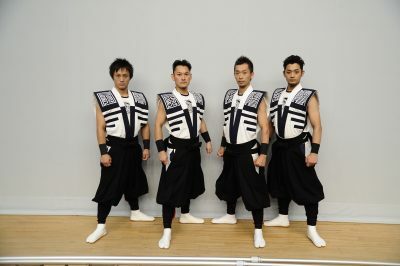 Since celebrating their 10th anniversary in 2005, the group began full-fledged activities as an independent unit with Shuichiro Ueda, Mikita Hase, Makoto Tashiro and Tasuku Tsuji as key members. The ensemble delights the audience with extraordinary taiko performances in various formats while exhibiting the individuality of each member. Inheriting Eitetsu’s aesthetic sense, the ensemble puts on a tight show with a good, grainy sound, dynamic tone sequences that combine the slow and fast, strong and soft, and polished sound landscapes. 2018 marks the 90th anniversary of the establishment of diplomatic relations between Japan and Canada. A wide range of events celebrating the 90th anniversary of Japan-Canada diplomatic relations are taking place across Canada during this celebratory year. The Japan Foundation is a non-profit organization that aspires to the role of catalyst for international cultural exchange, presenting valuable and appealing aspects of Japanese culture to other countries and promoting mutual understanding with peoples around the world. Part of a global network in 24 countries, the Japan Foundation, Toronto is the only Japan Foundation centre in Canada. 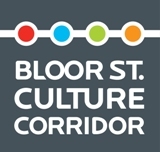 Located in the heart of the city at Yonge and Bloor, the Toronto centre has a gallery, seminar room, public library and hosts film screenings, exhibitions, lectures, Japanese classes and many more activities throughout the year.